Stephen D. Voran and Andrew A. Catellier of the Institute for Telecommunication Sciences (ITS) received the Department of Commerce (DoC) Silver Medal Award for designing and executing a highly compressed speech intelligibility testing regime that produced internationally accepted authoritative results to inform international standards under development for next-generation wireless communications equipment. The Silver Medal is the second highest honor granted by the Secretary of Commerce for distinguished and exceptional performance. The work was performed as part of the Public Safety Communications Research (PSCR) program, a joint effort between the National Telecommunications and Information Administration and the National Institute for Standards and Technology. The research was sponsored by the Department of Homeland Security (DHS), which leads an ongoing effort to enable interoperable emergency communications among 60,000 Federal, state and local public safety agencies. This work directly informed the international technical standards that will ensure that public safety mission critical voice communications requirements will be met by next-generation commercial off-the-shelf equipment worldwide. Voran and Catellier designed and executed a testing regime that accelerated speech intelligibility testing that normally would have taken 12 months into two months. Catellier was able to present test results that showed the intelligibility performance of different LTE speech codecs at meetings of the 3rd Generation Partnership Project (3GPP, the international standards organization for LTE commercial wireless broadband networks). Based on those results, representatives of the United States and five other countries took a strong and unified position on which voice codec is most suitable for the public safety user community, ensuring the next 3GPP release would contain a voice codec that meets the needs of public safety. Voran and Catellier’s work directly informed the international technical standards that will ensure that public safety mission critical voice communications requirements will be met by next-generation commercial off-the-shelf equipment worldwide. The compressed testing regime devised by Voran and Catellier models a fast-response, targeted research effort that builds on long-standing expertise to produce reliable and trusted objective results to inform international standards. Including speech intelligibility testing in future evaluations of voice codecs at 3GPP ensures a single stream evolution for public safety and commercial communications technology. For additional information regarding this award, please visit ITS Awards. 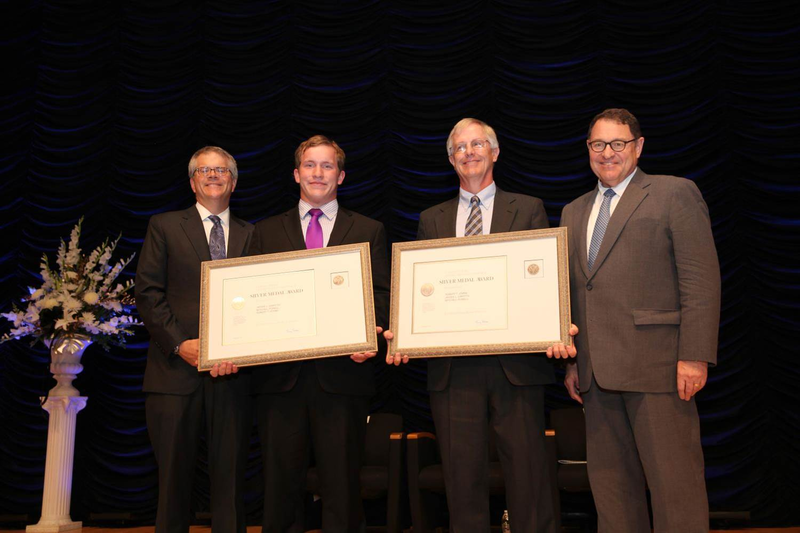 A team of three PSCR program staff received a group Silver Medal in the category of Scientific/Engineering Achievement from the U.S. Department of Commerce at ceremonies in Washington, D.C., on Tuesday, September 29, 2015. Dr. Robert Johnk, Jaydee Griffith and Mitchell Powell received a U.S. Department of Commerce Silver Medal for developing and using an innovative approach to measure building-penetration characteristics of radio signals, for implementing a compact, radio signal measurement system, and for developing an efficient and effective methodology for determining optimal configurations and designs for in-building communication systems for use by first responders. Building walls reduce radio signal power in complex ways, creating difficult and sometimes life-threatening communication challenges for first responders. The team investigated different building types and different ways to enhance coverage by LTE systems. Dr. Johnk developed an inovative test plan and, with the help of the team, performed a comprehensive series of measurements using a technologically advanced system to measure signal strengths and equipment performance. Because the system was mounted in a backpack, measurements could be conducted in places and circumstances that closely mimicked those of first responders moving through various building types during incident responses. Measurement results led to concrete recommendations (NTIA Technical Report TR-15-518 In-Building LTE Testing at the University of Colorado) for improving in-building performance of LTE communications equipment which are providing guidance to the public safety community, with the goal of enhancing the safety and effectiveness of America's first responders. 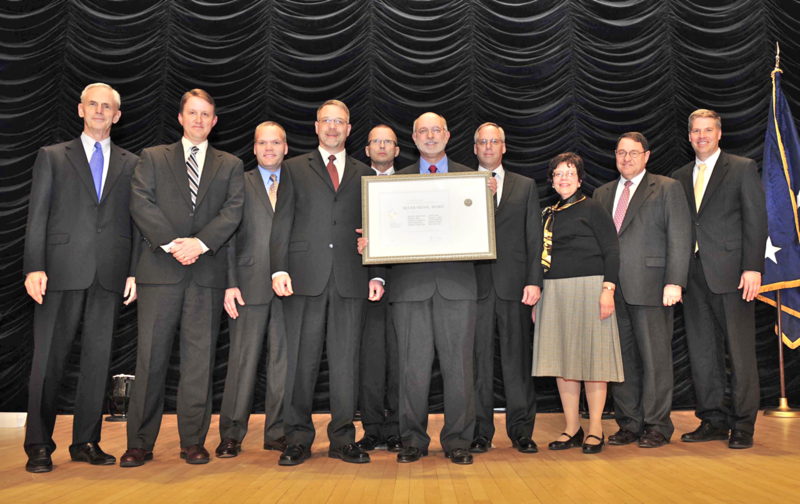 A team of ten PSCR program staff received a group Silver Medal in the category of Leadership from the U.S. Department of Commerce at ceremonies in Washington, D.C., on Tuesday, December 13, 2011. Jeffrey Bratcher, Ronald Carey, John Ewan, Eric Nelson, Dereck Orr, Christopher Redding, Dr. Robert Stafford, Irena Stange, John Vanderau, and Andrew Thiessen received a group U.S. Department of Commerce Silver Medal for leading the inter-agency effort that developed and implemented the P25 CAP to meet public safety's need for objective evidence that specific LMR systems meet standards of performance and interoperability. Previously, public safety did not have a consistent method to compare LMR based on rigorous testing for interoperability, conformance, and performance. Today, based on the efforts of the group and in cooperation with industry, the majority of P25 LMR products sold are represented in the P25 CAP. PSCR staffers, Jeffrey Bratcher, Andrew Thiessen, and eight other team members from five different offices of NTIA received a group U.S. Department of Commerce Bronze Medal on Tuesday, December 20, 2011, for furthering President Obama's Wireless Innovation and Infrastructure Initiative goal of establishing a single, nationwide public safety wireless broadband network. 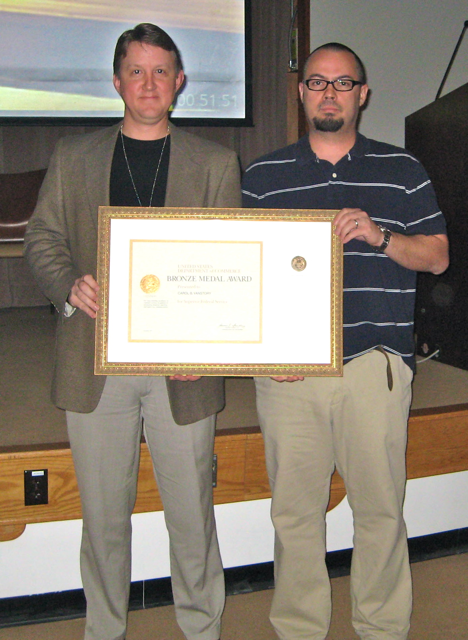 Jeffrey Bratcher (left) and Andrew Thiessen both of NTIA ITS, received a Bronze Medal award during a video-conference ceremony; the simultaneous presentation to their team members in Washington D.C. is videocast behind them. Dr. Carolyn Ford (below) received a U.S. Department of Commerce Bronze Medal for Scientific/Engineering Achievement at ceremonies in Washington, D.C., on Wednesday, December 1, 2010 in recognition of her initiative and leadership of the PSCR program's PSVQ team and development of the VQiPS working group. Dr. Ford's Public Safety Video Quality team developed a VQiPS user guide (PDF available here; web format available here) to help public safety agencies match their video needs to appropriate specifications, and to provide a communications framework between public safety agencies, researchers and industry for the development and dissemination of past, current and future research. Please click here or the caption below for information about the other two ITS staff Bronze Medal winners. From left: Carol VanStory, Robert DeBolt, ITS Director Al Vincent, Dr. Carolyn Ford. 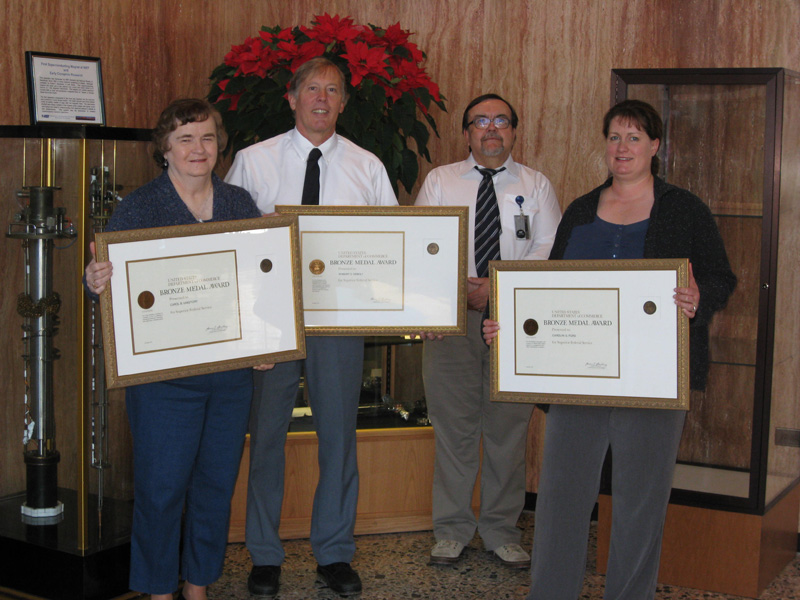 Three PSCR program staff received a group Gold Medal in the category of Scientific and Engineering Achievement from the U.S. Department of Commerce, the Department's highest honor, at ceremonies in Washington, D.C., on Tuesday, November 18, 2008. 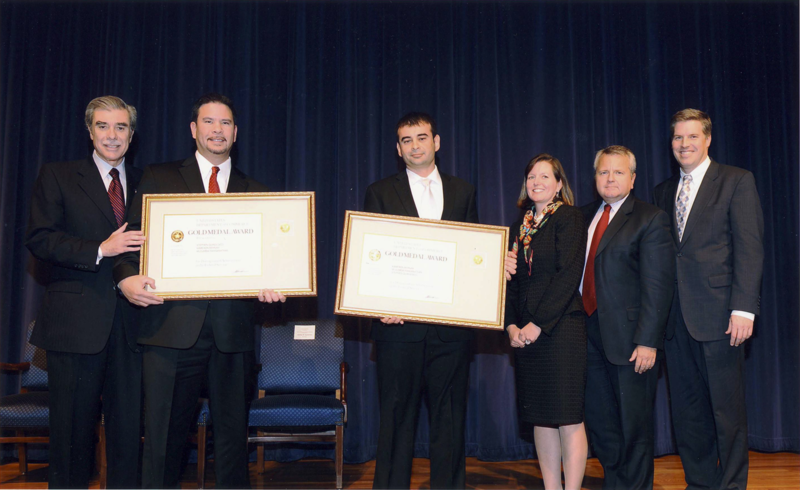 Kameron Behnam, Mudumbai Ranganathan, and Stephen Quirolgico received a group U.S. Department of Commerce Gold Medal for their efforts to enhance public safety communications. The team received the award for developing the ITT to test the Project 25 ISSI and CSSI. From left: Commerce Secretary, Carlos Guiterez; Stephen Quirolgico (Mudumbai Ranganathan is not pictured) of NIST OLES; Kameron Behnam of NTIA ITS; NTIA Assistant Secretary for Communications and Information, Meredith Attwell Baker; Deputy Secretary of Commerce, John J. Sullivan; and Deputy Director of NIST, Patrick D. Gallagher. 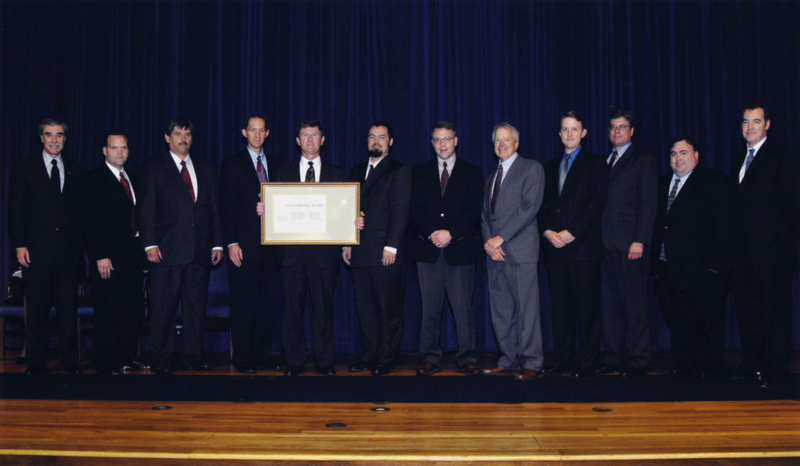 A team of ten PSCR program staff received a group Gold Medal in the category of Scientific and Engineering Achievement from the U.S. Department of Commerce, the Department's highest honor, at ceremonies in Washington, D.C., on Wednesday, November 8, 2006. DJ Atkinson, Randy Bloomfield, Jeffrey Bratcher, Dereck Orr, Eldon Haakinson (retired), Eric Nelson, Val Pietrasiewicz, Andrew Thiessen, Ken Tilley, and Bruce Ward received a group Gold Medal for their efforts to enhance public safety communications. The team received the award for assisting government-wide planning, assessment, and standardization of technologies to achieve interoperable communications among emergency responders. The team addressed technological advancements to improve radio coverage depended upon by police, firefighters, emergency medical personnel, dispatchers, and other first responders during local and national emergencies. This accomplishment supports the Commerce Department's goal of improving public safety communications to better serve Americans and protect American security. The Gold Medal award specifically highlights the team's leadership in two areas: developing a national strategy for improvement of public safety communications, and assisting the development of technical standards to enable rapid deployment of a new generation of digital land mobile radio systems. Federal, state, and local public safety agencies are widely implementing these systems today. From left: Commerce Secretary, Carlos Guiterez; Dereck Orr of NIST OLES; Bruce Ward, Ken Tilley, Val Pietrasiewicz, Andrew Thiessen, Eric Nelson, Eldon Haakinson (retired), Jeffrey Bratcher, Randy Bloomfield, and DJ Atkinson of NTIA ITS; and NTIA Assistant Secretary for Communications and Information, John M. R. Kneuer.